Our latest community mosaic, which was unveiled in Febryary 2018 is all about the history of Culver Street – a street which is almost unrecognisable following the building of the ring road. In the photo above you can see Culver Street in the foreground, running between the two rows of houses. 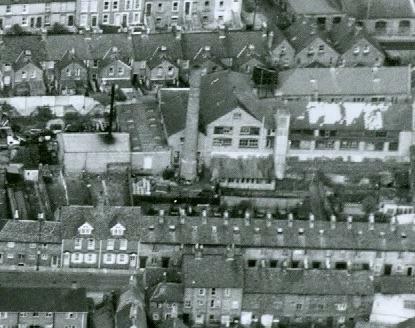 In the middle of the photo is the Invicta Leatherworks, later CB Daniels Ltd, with its large chimney. The next row of houses behind the leatherworks are on Rampart Road. All of these buildings were demolished to make way for the ring road. The only houses remaining are those right at the top of the picture, which are still standing on Rampart Road. At our open meeting about the mosaic design, we looked at old photographs and listened to oral history clips from those who remember life on the street. These included Margy Bodger talking about working at the Leatherworks (or “the skin factory” as she called it) and having to carefully match lilac coloured lizard skins to make accessories for the Queen Mother. We also looked through Arthur Maidment’s fascinating book “I Remember I Remember – The Story of my Boyhood in Salisbury”. The stories of Culver Street were woven into the mosaic design by our mosaic artist Joanna Dewfall, and the mosaic was made by a team of volunteers under Joanna’s expert guidance. We made the mosaic at Graham House on Culver Street, a Wiltshire Council Sheltered Housing Scheme. The makers came from across Salisbury including people from Graham House and other Wiltshire Council housing schemes. Many thanks to the Wiltshire Council Resident Engagement Team who worked with us on this project. Thanks to Wiltshire Council, Salisbury City Council and Salisbury and Stonehenge Tours who have funded this mosaic.